The SAT was explicitly rescaled in 1995 or so. Grade inflation has been going on for decades. Back in the 80's, I noticed that almost all the young engineers I interviewed had GPA's of well over 3.0. When I was in engineering school in the 40's, the GPA for engineering students at my university was 2.1. There was a piece in the WSJ in the 70's or 80's stating that university GPA's had gone up by 0.7 during the period of their study. There are two problems. Schools and departments compete for students and their funding depends on enrollments. If grading is tough, the students go elsewhere. Also, students feel that getting good grades is the most important thing. Thus they tend to take snap courses for electives. At the K-12 level, teachers are urged to pass on poor students so as not to hurt their self esteem or ruffle the feathers of the parents. The result of all this is a mess where 284,000 college grads are working for minimum wage as a result of taking snap courses, a trillion dollars in student loans, and a semi-illiiterate citizenry. We seem to have our fingers firmly pressed on our self-destruct button. We need to flunk kids that aren't learning, quit teaching worthless courses, and making it clear that one MUST study and work hard. The current entitlement mentality is killing us. Yes I was going to post this myself. They made it much easier to get to 1600 - who knows how that chart is scaled. Another test the ACT might be better because it actually evaluate knowledge in English, basic Science, and basic history. SAT is mostly about logic puzzles, even in the English language sections, and math tricks in the math section which can easily be taught. "... 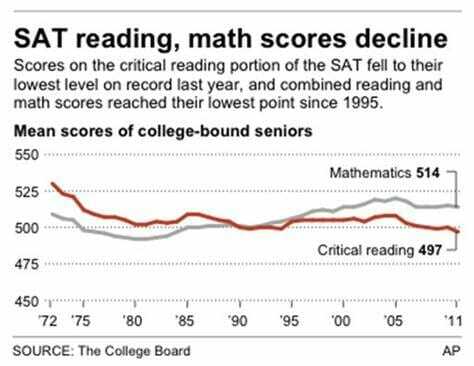 I am not at all convinced that the test scoring does not shift over time (no WAY my son had a higher score than me..."
The SAT was "renormalized" back in the 1990s. That shifted the scores up by about 100 points. The SAT can be used to assess student performance over time, but it takes a bit more work. Let's say you want to compare 1973 scores to 2013 scores. You look at the data and note that 25% of high school students took the SAT in 1973 and 65% of students in 2013 (those numbers are guestimates). Because of the huge difference, the scores can't be compared directly. Instead, you compare all the SAT scores from 1973 to the scores of the top 25% of high school students (or the 38% of the SAT-takers) in 2013. After "denormalizing" the 2013 scores, you can compare 1973 to 2013. With regard to your comment about activities (violin, bagpipes, falconry) I think its important to note that this is probably only a factor for students going into the Liberal Arts. My youngest starts college this fall - he has absolutely no outside activities other than a couple of school clubs and playing guitar (what teenage boy can't list that nowadays). He was accepted everywhere he applied; including a large scholarship offer to Baylor. The difference being that he is going into Mechanical Engineering. The key factors were SAT score (Math Level II to be precise) and what classes he took in high school. He could have had his pick of Engineering schools due to these high scores and academic background. I was reading Seth Godin's manifesto on education the other day, 'Stop Stealing Dreams: What are schools for?' Not a lot new material but some good observations. He did have this one interesting tidbit. The multiple choice test will be 100 years old next year, first used in 1914 to process for WWI. The multiple choice test was later disowned by its instigator, Dr. Kelly, he was promptly fired from his university presidency. efficient way to keep the mass production of students moving forward." a. celebrate next year by filling in the oval with a number 2 pencil, being careful to stay within the lines? b. throw up a little bit because we have test anxiety? d. none of the above, because no one cares? Multiple choice tests feel really dumbed down compared to the free essay forms I am used to. There is no development of complex thoughts, it's more of a pattern recognition exercise. The scariest difference I can see is that students tend to almost not at all reflect or question. It's regurgitate some barely understood facts, let them stand there, done. Alltogether, these are tendencies that have me real worried. Barry had on all of his college applications that he held 7 national high school records in The Highland Games (six individual events and the overall point total). In his essay, he spoofed himself, pointing out that he was the winner of all six events and the overall title at the first (and, at the time of application, only) high school version of the games. It was good enough to get to Lafayette, where he is exceptionally happy. "No way my son had a higher score than me"
That sounds like an SAT grammar question! The mix problem is serious. Some school districts require all students to take the SAT; some stear you away from them unless they think you will do well on them. As you say, if you want to go to a decent college, then you have to take SATs. So the more people who try to go to college, the more will actually take the test. Good catch. It's fun to peer at a graph and try to pick something out of it, but if your data is just bad, you shouldn't even try.